Advanced Seeds produces all its cannabis seeds using organic farming methods, only natural fertilisers and insecticides are employed. The production has been carried out under strict controls in isolated rooms to ensure the identity of each variety. 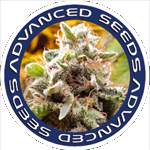 Advanced Seeds uses a completely safe method to obtain feminised seeds without any kind of genetic manipulation.